Check out these unique vintage "entrance ticket / boarding pass" style invitation templates, great for destination weddings, "Roaring 20's" or Great Gatsby themed wedding parties and many more! All cards are available in over 20 different paper types and sizes. Top 10 Vintage Ticket Style Wedding "Save The Date"
These lovely vintage ticket 'save the date' wedding invitations are a novel way to announce your wedding plans to family, friend's and loved ones. With some great designs to choose from, like nautical boarding pass, train ticket, Parisian theme ticket, and clock punch. No matter what theme of wedding you are having these 'save the date' invites can suit existing wedding themes or be a novel stand-alone idea to compliment your wedding. Some popular themes of wedding which use vintage ticket style invitations would be, vintage shabby chic wedding, Victorian Steampunk style wedding, Boho style wedding, or even a traditional church wedding. 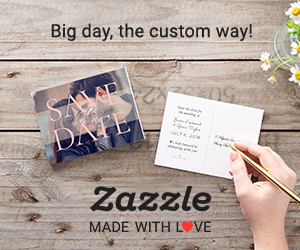 All 'save the date' wedding invites can be personalized if you desire. Simply enter your guests name and party details before changing the font, style, colour, and layout. You can also choose from a number of paper styles and finishes for the perfect invitation. Invite guests to your wedding with a fun and stylish, vintage ticket 'save the date' invitation.